That's a very tastly looking loaf Eric! I was thinking of your nice new mixer while trying to chop the seeds in. It's a grand taste this one. but with seeds instead of rye kernels. Man, that is really packed with seeds! I can imagine that it tastes very good, indeed. You and Khalid have each done very well with this bread. Yep, Vollkornbrot with WW. Now having made this, I am appreciating the need to maximize the toasting of each type of seed. So much of the flavor comes from the seeds, I see now I could have toasted each one individually and improved the flavor even more with a full toasting. Next time. Khalid's post on his recent blog made me add this loaf to my week's baking line up....but this week is full so it is slated for next week...you beat me to it and now I am thinking of juggling things around so maybe it can be done sooner...so inviting. Anyway, this loaf looks great and thanks for the reminder to roast the seeds separately....I always forget to do that and end up with burnt sesame seeds and raw pumpkin seeds when I roast seeds for other loaves. In fact my loaf of the day today is his Potato Rosemary Bread and it is calling to me to be shaped into rolls as I type. I like the roller for fragile add in's but the seeds are not fragile. I waited until the dough was well incorporated before adding the seeds and only continued until it look mostly complete. Then I finished by hand with a couple stretch and folds on the counter, after a brief rest. The potato rosemary sounds good too. Hope you post it. That's a beauty Eric. I know exactly what you mean when you say that toasting it brings out another level of flavour. 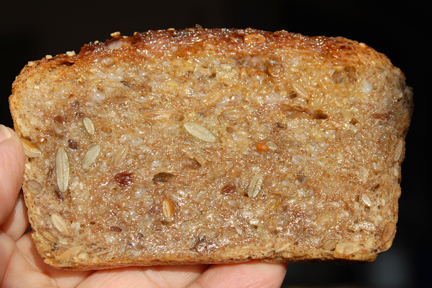 These kind of seed loaves make excellent toast and are heavenly with melted butter. That is almost 20% seed you have in that recipe. No wonder you didn't get any oven spring. I didn't give the toasting all the care I could have but it still was delicious with the little browning I did do. Woo boy does that ever look tasty Eric! 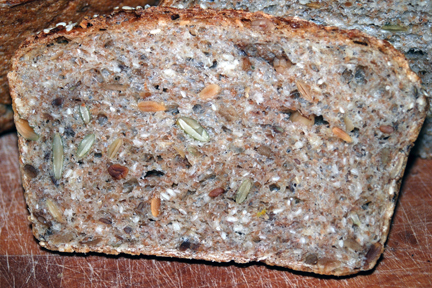 Paul hit it right on the money comparing it to a Vollkornbrot with seeds, but this looks and sounds so much better. Just when I thought I had enough baking books, ;^) now I have to put an order in for Rheinhart's WGB...thanks a lot Eric! LOL! You and Khalid are both top notch bakers so if you guys say it's a book worth having I can't think of two better people to take a recommendation from. I've been hearing about Rheinhart's 'Epoxy' method for a while now and I'm intriqued to learn more about his technique. Marvelous bread, nice baking! I have enjoyed getting to learn a little about the epoxy method. It does work well and it's easy to set up the night before. Thanks for your comment Franko. Discovering WGB - better late than never, Eric and Franko! I consider Peter Reinhart the best bread baking teacher I know, his comments and descriptions are easy to understand and to follow, and, since he uses "master formulas" you can easily adapt recipes from other books to his "works-all-the-time method", as well. I made almost every recipe from BBA, WGB and ABED, with really reliable success (though I reduce the sweetener a bit). I can imagine, Eric, that kneading such large batch of this stiff dough (from the many seeds) by hand could easily lead to early arthritis. My powerful Hobart was already groaning a bit, when I made my last six loaves! But the bread is very good, and well worth the effort. The WGB Potato Rosemay Bread is another very good bread, you should definitely give it a try. I have so many bread books that I find myself focusing on one until the next one comes along or someone posts a great looking bread. I've had this book since it was first published but haven't baked much from it. I plan to do a double batch of something from it for a while now so I get the drift on incorporating by hand better. Yesterday I did the enriched 100%WW sandwich bread. I used rice milk instead of regular cows milk as it was destined to go to my grandson today who is allergic to dairy. I stole a slice from the end as it went out the door and it tasted good. I didn't get as much rise as the book image and it was dense but soft. Any suggestions Karin? My present stock of WW is stone ground so that might have a part in lower rises. I'm expecting a fresh batch of fine ground tomorrow so we will see. Anyway, thank you Karin for your encouragement with this bread. It is delicious. I'll give the potato rosemary a look. Took me awhile to get the feel of the dough and the proofing times down when I started using his method. Two things come to mind about your loaf - one is the amount of kneading - did you get to the windowpane stage? I find I generally have to knead longer than he specifies in his book and I keep going until I get a good windowpane. I have never used rice milk so I really don't know how that might have affected the rise. I have used powdered milk, powdered buttermilk and yogurt and all have performed well. I have never baked with anything other than home milled fresh grains so my loaves act very differently than those made with store bought flour - thirstier and longer kneading times. Karin did a great job describing why WGB is such a great learning tool. Because of it I have been able to convert just about any bread over to a whole grain version simply by plugging in a few numbers. His epoxy method revolutionized my bread making abilities and I will forever be indebted to him and his teaching style! I don't have a lot of experience with 100% whole grain breads. I've done quite a few 100% rye breads and a few WW over the last few years. I didn't really enjoy the aroma and flavor until I started using the Organic fresh ground flours from flourgirl51, Organic Wheat Products . I was amazed at how much better her fresh ground grains are. Now I'm spoiled. I'll have to take a look at the next batch and be sure the gluten is developed and go form there. My WW sandwich loaf rose some but didn't budge in the oven. I imagine the ww flour you baked with and didn't like the flavor of had gone a bit rancid. WW does that very quickly unfortunately. I read somewhere about only letting ww loaves rise about 80%. If they go over that - oven spring is diminished. I try to practice that but am not always successful but the loaves still taste great and people I bake for like the shorter loaves - nice to have a smaller slice of bread at times :-). As many say here, 'flavor rules'. I've also neglected exploration of WGB and am inspired by your bake of this bread. In my own case, I think my apathy in not baking more from this book is that I didn't take the transition road first. I jumped right in and made mostly 100% whole grain breads instead of graduating from using half bread or high gluten flour. As a result, my breads were more dense and less like the things I had been making. This is one of the transitional breads.If you look at the recipe list, many just jump off the page wanting to be tried, a least they do for me.I've been bitten by the whole grain goodness bug. I think this will be my new direction for a while. I look forward to seeing what you do. I use a sourdough starter whenever given as an option in WGB recipes. I can't say that my loaves don't rise high enough, but I have no experience with freshly milled wheat - Janet told me that it has to be treated a bit different - so that could be the reason. I find, though, that 100% whole wheat doughs really benefits from longer fermentation, I make the pre-doughs in the morning, the final dough in the evening and retard overnight in the fridge, so the soaking/fermenting time is 24 hours. 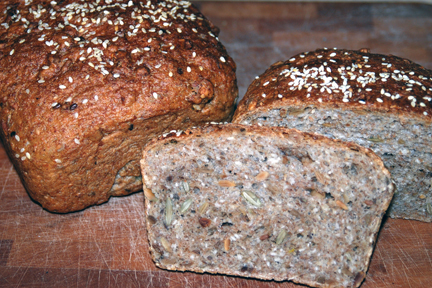 100% whole wheat breads are, also, the only WGB breads where I don't cut much down on the sweetener - it needs it. Can you tell me what temperature range you are using for the fermenting? Maybe I'll adjust my schedule to start in the morning. Thanks for the tip. My refrigerator is about 40 F, otherwise it's the prevalent kitchen temperature, which can vary between 64 and 72 F (or warmer in summer). I'm really lucky, so far I had never any of my organic flours turning rancid though there are not really stored in a cool place. I find my schedule with bulk fermenting overnight very convenient. Just taking out the dough from the fridge in the early morning hours doesn't overtax my "woozy wee hour brain". I used the proofer set at 74-76F if I recall for the ferment and pan proofing. The loaves grew about 50% and I thought they looked ready. Spritz with water and seeds applied, into a hot oven with steam. Baked as called for 375F and they didn't budge. To me that sounds like under development or not enough time had elapsed in ferment to develop the gluten. I was using IDY also. I'm itching to switch to my natural levain as soon as I identify this issue. To many balls in the air and I won't learn what the issue was. When I get a shipment of fresh ground flour, I generally put half in the freezer. That way the product stays fresh until I need it. I could never get up to get the dough out of the fridge and go back to sleep. Lol, When my eyes open, that's the start of the day for me, regardless of when it is. Like Franko, I have sworn off (sort of) buying any more bread books until I fully investigate the ones I already have. However, Eric, with this post you've compelled me to put WGB into my Amazon cart - thanks! It's that butter-soaked shot that did it! Goodness gracious moi - I want some! You know you will love it. The method is totally unique and I think you will appreciate the outcome. Good luck. Glad to know you liked the flavor, Eric! Yours looks beautiful! My bread didn't turn out dense like a volkornbrot. Did you aim for a windowpane prior to adding the seeds? what was the final hydration on the dough? did you add extra wholewheat flour in the final dough? I didn't, i believe that most of Peter Reinhart recipes do not need the extra wholewheat, nor any wholewheat flour addition in the final dough. I aim for a slightly sticky dough, and didn't toast the seeds either (forgot to do so), but this may have helped avoid sharp edges from roasted seeds that tear into gluten.White wholewheat may have helped get a better rise, but i think that the key to an airy crumb in any wholewheat bread is: increased hydration, and fully developed dough. I knead by hand, and after the initial kneading, i rest the dough for 5 minutes, and then i stretch a piece of dough out to test for a windowpane. Thank you my friend for the mutual inspiration! To answer your question, yes I did add additional WW flour in the final dough. It was quite sticky and no where near tacky. I couldn't say I had a windowpane. As soon as the dough was completely combined, I added the seeds. I then removed th e dough to the counter and did slap and folds as I added flour to get to what PR says should be tacky. I didn't measure it but in my 9# batch I would estimate another cup at least, maybe 2. I was trying to mix as little as possible. Another thing that might be at issue is that the whole wheat flour was stone ground and not the fine grind. It does tend to be a little course. The next batch which should be here soon will be fine grind. I could feel the gluten pulling back so the bonds were forming.I am optimistic that the finer flour will create a dough that will better trap the gas. Thank you Khalid for your kind words. Like Khalid I thought your Many Seed Bread was a bit denser than mine usually turns out. But it definitely doesn't have anything to do with roasting the seeds or not. I always roast mine, they just taste better. Looks like a great tasting bread, love the toasted slice with butter. Bet it would be tasty with cream cheese as well. Had this book out of the library a while back, must re-visit it soon! I had the same thought about cream cheese. Delicious!